During my first visit to Pic De Bugarach I did not know what to expect. By some form of luck I was guided to rent a room at the base of the Stargate mountain. I had heard many stories about Bugarach and its magical energies. It was hard to imagine where this journey might take me. I had been living near the town of Albi, about 100 miles away and found the energies of the land quite extraordinary. During this six week stay I lived on a farm and found my meditations riveting with the new experiences felt of the French lands something I had never perceived in America. As powerful as this quiet rural life was it did not prepare me for what I was about to experience in this special, mountainous place. 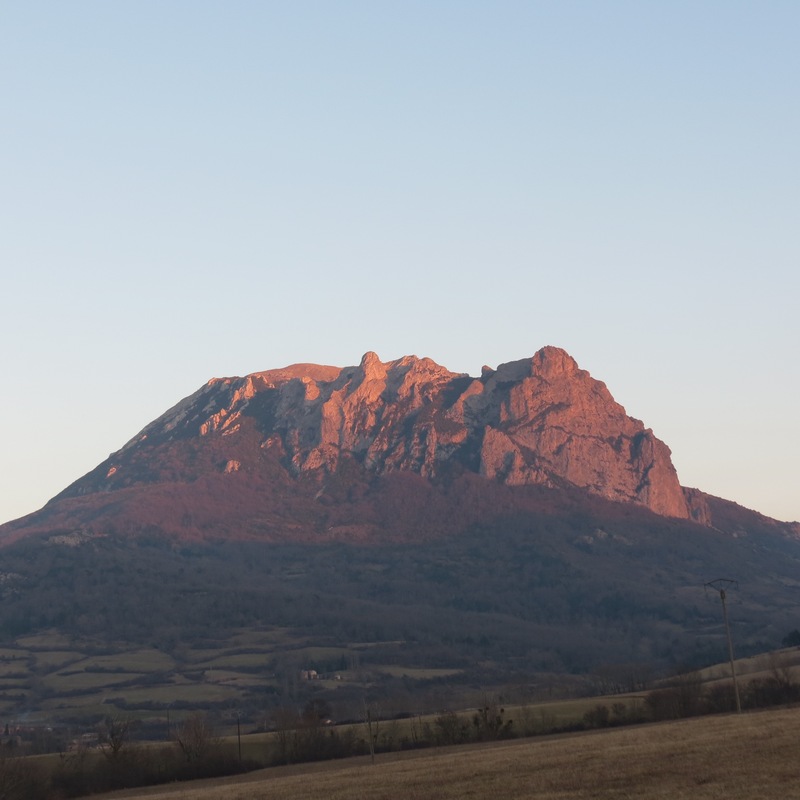 While driving to my destination of the little village of Le Linas, located at the base of Pic De Bugarach I found these foothills of the Pyrenees Mountains extraordinarily beautiful. I was traveling through winding country roads through small towns such as Couiza and Rennes Les Bains to my destination of the town of Bugarach and then up to the base of the mountain at Le Linas. I did not know what to expect as I had not even seen the photo of the mountain but I was told by friends that the energy streaming out of the mountain was so intense that helicopters or planes would not pass over it as it would distort their compasses. Others told me of the high incidence of UFOs in the area. This all stimulated my curiosity but I still did not know what to expect as I drove on a narrow country road that constantly curved along the mountainside following the River Sals whose water source is of Pic De Bugarach. As I completed one turn I opened onto an opening of the mountain forests where I could see several miles in the distance and there the great mountain sat in its prominent position. I really did not know what the mountain looked like as I had not seen any photos of it but when my eyes were placed on this peak my heart expanded in the form of an explosion with a white light of energy. I knew I must be looking onto the Pic De Bugarach. The experience was quite a introduction to this area called the Aude Region of which I begin this annual journey six years ago. Every time I venture into this area my consciousness grows, I simply feel an expansion inside of me that opens me to become a greater being so it is a natural place for me to embark on my own spiritual growth. When I am here it feels like a vibrant expanded energy moves through me that enhances my psychic abilities, everything moves more profoundly whether it be in meditations, perceptions or creative writing. Everything is turned on inside me as if I have plugged into an additional electrical current. Over the years I have discovered various power spots in the area such as churches, caves, megalithic stones and forest. All of these places have one thing in common and that they have ley lines moving through them whose source of energy is likely the Pic De Bugarach. For me, much of my time is spent going to these sites on a daily basis. There are great places to meditate, process emotions and explore my internal journey. It is such a joy to live a common simple life where one slows down and flows with the special magic of the land. Each year after visiting and then returning back home to Austin, Texas I feel transformed into a new level of consciousness. After five years of journeying to this sacred land I continue to grow and help facilitate transformations for other people. That is what the sacred sites are designed to do, to open the person so they may evolve, to have light shine into their soul so that a new spark may be lit, shadows enlightened and a new inner direction inspired. I cannot think of a better way to live my life. Austin Texas in the United States has a different vibration, I evolve here in my home country but in the French Pyrenees it is easy to soar to new heights.